Over the two years I’ve spent on a ketogenic diet in an effort to prevent progression in a grade two brain tumour, the top thing that has frustrated me is finding information and recipes specific to cancer management. We are fortunate that there is a great deal of information available focused on the ketogenic diet, but much of it is targeted to weight loss, or managing health issues such as diabetes and epilepsy. While that is useful information, there are concerns specific to using a therapeutic ketosis approach for cancer. This book is a perfect example of that kind of specific information. It is focused on the use of a ketogenic diet to manage cancer, and, as the title promises, how to practically put the recommendations of research in this area into use on a daily basis. My favourite things about this book begin with the fact that the author, Patricia Daly, is not only a certified and registered nutritional therapist, but a cancer survivor herself. She lives the same challenges we all face every day. She eats this way. She knows the challenges of balancing a career, family, and a therapeutic diet, alongside the pressures of knowing that if you “fall off the wagon”, the consequence is not that the number on the scale won’t go down this week, but that you fear your tumour will grow, or come back, or metastasize. What will you find in this book? First and foremost, you’ll find 14 days of meal plans that guide the reader how to eat less than 12 grams of carbohydrates in total, per day. Why is this important? Briefly, the only published and peer reviewed research on the use of the ketogenic diet to manage cancer, currently, is in animal models, though human clinical trials are underway. Presently, most experts recommend less than 20 grams of carbohydrates per day for cancer management, and upwards of 80% of daily calories sourced from fat. This is one of the key differences between using this dietary approach for cancer management and for other applications, such as weight loss. Many people eating keto for weight loss are advised to simply lower carbohydrate consumption to 50 or 100 grams per day, then use blood or urine monitoring of ketones to assess how many carbs they can tolerate and still lose weight. Consider now that if you are using keto for cancer, you need to be on guard when reading recipes that are “ketogenic”, because they may be targeted at a population eating ten times more carbs per day than you want to. Seeing 14 days of what would be considered “VLCHF” (VERY low carbohydrate, high fat) menus is invaluable to really appreciate how the cancer diet looks in real life. Patricia starts off by relating her personal story and success with the ketogenic diet. She then includes a brief section outlining the idea behind using it to manage cancer, relying on strong references and some of my other favourite resources in this area. She includes a very nice outline of “how to use the book”, showing you how daily meal plans are set out, and what features are included on each meal plan and recipe. There is a nice “at a glance” quick reference table of ketogenic foods included. Each day, as well as each meal for the day, includes a macronutrient analysis that shows both percentages and grams carbs, protein and fat. This is so valuable, and is often information that is only available using commercial software. Variety in recipes, helpful for people who’ve become bored with the diet, or who are afraid to start out because they think there aren’t enough interesting options. Different breakfast every day – I find breakfast a hard meal, don’t believe anyone who tells you it’s impossible to get tired of bacon and eggs! Versions of recipes I’ve seen elsewhere that are modified here to be the lowest carb possible, such as chia puddings, granola bars, breakfast granola and porridge; these are good examples of recipes you can find on keto sites that might take up your whole day’s carb allotment if you’re not careful, but Patricia has given you a VLCHF version here. Excellent references section that includes books, websites, podcasts and also (cheers!) scientific references. Great section of snacks and suggestions for “buffer” foods to fill a fat or protein requirement for a day where you may be short – this happens more often than you might think! This diet is likely forever for me; I need to make sure it’s interesting and varied enough to stick to. While it doesn’t have to be impossible, it’s still a commitment; there are no cutting corners or tricks, and there is not someone else who can do it for me that will make it the same as a lifestyle of “pick up processed” foods. This is about time in the kitchen, and preparing your own food. You can’t deceive yourself about that. It’s easy to overeat carbs if you’re targeting as low as 12 grams per day – I noticed how even veggies are limited to leafy greens in many cases; there is a good example of a green juice included so that you can see how many carbs can be drunk up in something most people would think might not even “count”. I need to eat more fish. And try organ meats. Some of my favourite recipes, after a few weeks of experimentation, include a lovely turmeric dressing, protein biscuits, filled coconut crepes, mushroom with salmon tapenade, a manchego pizza, olive & artichoke pate, and a nice miso soup. My favourite cooking instruction was to combine, mix, etc, “and whizz”. Makes it sound so fun and easy. That’s my new favourite kitchen verb. This book is available in eBook format from Patricia’s website. 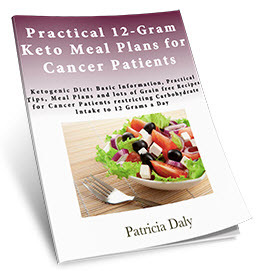 If you are using a therapeutic ketosis approach for cancer, or have a loved one you want to introduce to this diet, it belongs on your bookshelf. re: And try organ meats. Do focus on organic. In particular, the livers of CAFO critters are probably concentrated toxin repositories. In case it escaped your notice, a paleo and apparently keto mayonnaise just hit the market yesterday. It actually has a room temperature shelf life. It differs from most paleo mayo recipes in using avocado oil instead of olive oil. It’s also available a little cheaper on a membership site linked from MDA’s blog. It’s pricey, and probably back-ordered, but I plan to get some to try (no cancer here, just eating healthy). I expect other suppliers to at least attempt to mimic this, which will drive the price down. Thanks, I saw that mayo somewhere online, and am interested to hear what people think. Mayo-type sauce is one that I find pretty easy to make at home, and I use avo oil, so I’d like to see what people think of the commercial version! Thanks, Alix, for the detailed book review of Patricia Daly’s cookbook. (I’m L.m. Qian, also known as Lily, from your Facebook group, the one who cooks all the keto meals for my husband with cancer). I recently ordered Patricia’s cookbook and promptly made the Shepherd Pie. I did have to google a lot to convert grams to cups/TBS, etc, but you are right, it is nice to see exactly what macros are supposed to be eaten when eating keto for cancer. Reading your review made me want to revisit Patricia Daly’s cookbook, and actually try cooking a whole day’s worth of meals, to experiment with how much carbs, fat, and protein looks like for keto eating for cancer. Until her cookbook, I’ve been using recipes found online via Pinterest, as well as recipes from Dana Carpender (Fat Fast), Marie Emmerich (sp? ), and Martina S’s KetoDiet iPad app, never really knowing in a concrete way just how much to eat (basically, my husband and I are eye-balling it). Thanks again for your site. You’re the reason I found Miriam Kalamian, Ellen Davis, and now Patricia Daly’s books on cooking/eating keto for cancer. Every day, I’m learning more and more! Hi, Lily, it’s a true pleasure to meet you here! Thanks for reading. I wad literally just telling my husband about reading your story on the Faceboom group while we were eating our keto supper! You inspired me today! Thank you. You are welcome! Thanks for inspiring us too. Your work is immensely valuable. I have even told my friend with seizures (she has an AVM in her brain, aka Arterialvenous Malformation, and has had a few brain surgeries done) about your blog and about the ketogenic diet, as she takes anti-convulsants such as Neurontin. I think the more people know about the ketogenic diet, the better for all, as what you eat is so important. So grateful to have found your site (and your Facebook group too).